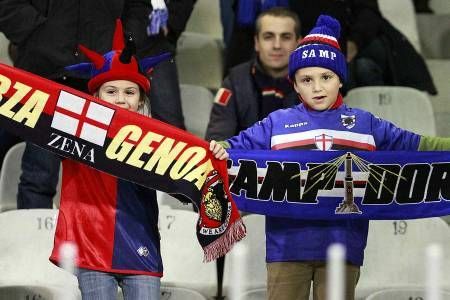 Genoa vs. Sampdoria is one of the most heated games in calcio, and the Derby della Lanterna (named after the lighthouse that towers over Genoa’s port) is always a hotly contested, emotionally charged game of football. The derby has existed in its current format since Sampdoria’s formation in 1946, but its history stretches all the way back to the early 1900’s. The first derby took place in 1902, when Genoa C.F.C fell to a 3-1 loss at the hands of Andrea Doria (one of Sampdoria’s many precursor clubs). These two teams competed in the Genoese derby for its first 24 years of existence with Genoa winning more often than not. The Rossoblu won 28 out of the derby’s first 44 games, with Andrea mustering a paltry 7 victories before 1946. Sampierdarense joined the party in 1926 following the town’s annexation. Sampier (shortened for convenience) fared no better than Andrea, and scored just 1 victory in 13 games against Genoa. These results aren’t at all surprising. Genoa were one of the biggest clubs in Italy at the time, while Sampier and Andrea were very small in-comparison and never came close to matching Genoa’s success. Andrea Doria, in fact, were so hard done by that they couldn’t afford their own stadium and had to cram fans sardine-style into a very small area around the outside of the pitch. As a Brit, the idea of more than one team competing in a derby is strange enough, but Genoa, Andrea Doria and Sampierdarense weren’t the only clubs to compete in the Derby della Lanterna. First came “The Dominant” (or “The Dominant Football Association,” if you please). Formed in 1927 from a forced merger of Andrea and Sampier by Mussolini’s government, the fascists’ idea was that the city’s rivalries could be tempered by the foundation of one “Dominant,” all-encompassing Genoese club. The Dominant wore imposing all-black kits. How fitting. I’m not entirely surprised by this move, as Mussolini’s government’s distaste for Genoa C.F.C. at the time is very well documented. The fascist regime took umbrage to Genoa’s English heritage and un-Italian name (“Genoa Cricket and Football Club,” which Mussolini even forced them to change at one point). It’s perfectly reasonable to assume that The Dominant were formed to “dominate” Genoa and bring the side down. The merger, however, didn’t exactly impress the fans of the two old clubs and The Dominant didn’t last very long. 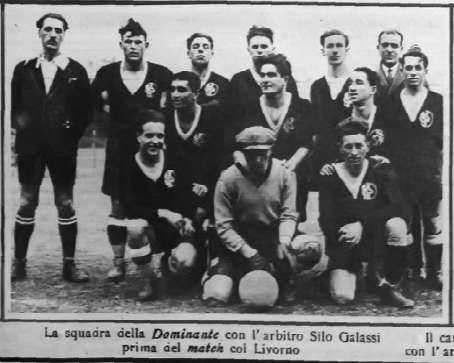 The hair-brained scheme fell apart in 1930 when, after two consecutive 10th-placed finishes in the Italian Championships, The Dominant weren’t invited to take part in the newly formed Serie A. The club ended-up in Serie B and the decision was made to merge them with another local club, Corniglianese, with the aim of improving league performance. Anyway, Andrea Doria and Sampier eventually merged on 12 August 1946, leading to the formation of U.C. Sampdoria and the establishment of the Derby della Lanterna as we know it today. The merger was tricky: Sampdoria knew it would be a hard sell after the backlash that The Dominant created, but they succeed in amalgamating the two clubs without much opposition. I guess Mussolini not being involved probably had something to do with it. The first game between Genoa and Sampdoria took place on 3 November 1946 and resulted in a comfortable 3-0 ‘Doria win. Genoa had pretty rotten club in the fixture’s early days, only winning 2 of the first 17 fixtures, but things slowly improved for the Rossoblu. A total of 81 games have been played to date with Sampdoria winning 29, Genoa 21, and 32 ending as draws. It’s difficult to decide which team has the historic bragging rights. Sampdoria have the edge in the head-to-head records but are currently stuck in Serie B after last season’s relegation. Hold the edge in domestic success (they’ve won 9 Italian titles to Sampdoria’s 1), but ‘Doria won the Cup Winners’ Cup in 1990 and where Champions League runners-up in ’92. I’ll let you decide which club holds more recent prestige. One of the most notable derbies came in 1951. Sampdoria were safe in midtable but Genoa were struggling at the bottom of the table and in dire need of a win. They met on April 24th and Sampdoria raced to a 2-0 lead after just 17 minutes. Genoa battled back to make it 2-2, but an 88th-minute Mario Sabbatella winner broke Rossoblu hearts and sent them tumbling down to Serie B. On 17 March 1973 they met with even higher stakes. Genoa were bottom of the table and Sampdoria second-bottom. What was known as the “Last Resort Derby” ended as a 1-1 draw that helped neither team. Sampdoria’s last minute equaliser left neither team with any real hope of surviving the drop and both were relegated at the end of the season. 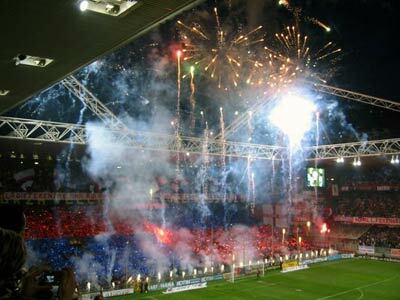 The Derby della Lanterna of March 13th 1977 is considered Genoa’s revenge for the result of 1951. This time Sampdoria were in the relegation zone and Genoa were safe. The Rossoblu came back from 1-0 to score a 2-1 victory against their rivals, and, while this specific result didn’t consign Sampdoria the relegation, the Blucerchiati fell into Serie B at the end of the season. Genoa Ultras make their presence felt prior to a recent Derby della Lanterna. As significant as these games were on a local level, the derby didn’t really take-off nationally until the late ‘80’s/early ‘90’s when both clubs were flying high in Serie A. The games were often thrilling despite the low scorelines, with Sampdoria earning the lion’s share of victories. Last season’s games both ended in single-goal Genoa victories (1-0 and 2-1). Serie B looks an incredibly tough division to get out of this year, but hopefully it isn’t too long before these two have a chance to renew their rivalry.